A totally new president candidate? No. people’s cry was buried again. 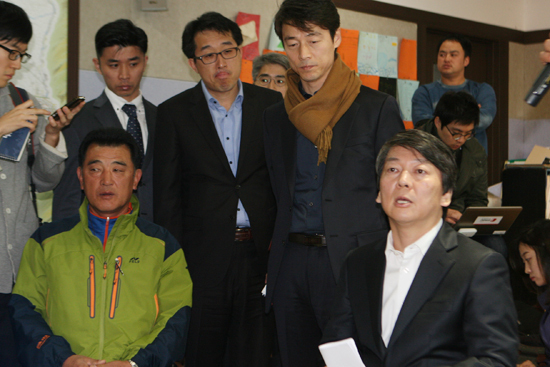 On Nov. 2, Ahn Chul-Soo (independent), one of the big three Presidential candidates along with Park Geun-Hye (ruling Saenuri Party that is also called, New Frontier Party) and Moon Jae-In (Democratic United Party), for the 18th South Korean President election, dropped by the village for less than an hour, after his visit to the April 3rd Peace Park in the Jeju City. He was the first of the three who visited Gangjeong. For the background of Ahn, see here. Lots of media reporters that we have seldom seen during our years’ protests. From where did these reporters come while there have been only a few of them during the years the village has suffered? Some says his words are calculated not to provoke the conservatives. However, Cheong Wooksik, representative of Peace Work has criticized on Ahn’s such remarks. See here. The below is a translation of parts of Cheong’s writing in July, this year. Above all, he is lack of correct understanding on the facts. Even though it is a fact that the Jeju naval base project has been ‘examined’ from the Kim Young-Sam government (*1993 to 1998), it is fully different from ‘decision.’ Even though the project was reflected in the National Defense mid-term plan 1997-2001 in 1995 as its need was newly decided in the meeting of Joint Chiefs of Staff Council in 1993, it was merely that the military authority asked to the government. Even though many projects are included in the defense mid-term plan, there are also many projects that are excluded during the government policy decision process and National Assembly discussion process on budget. 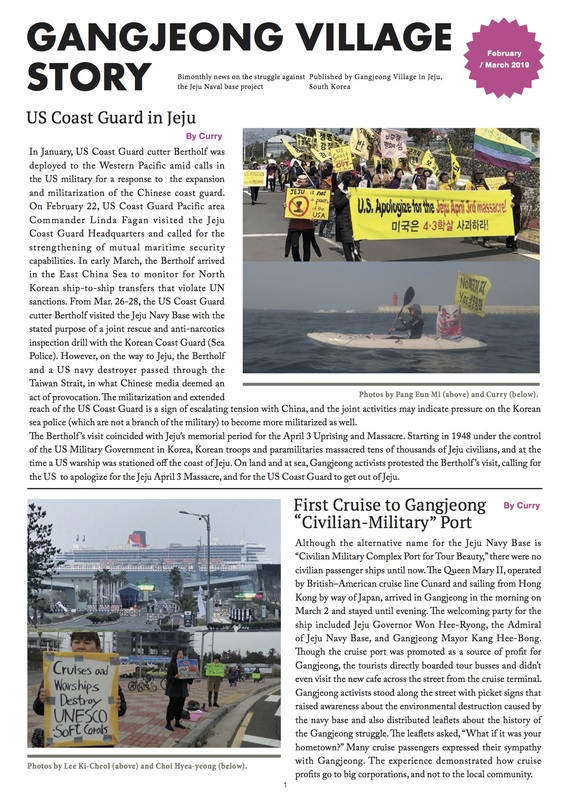 In case of the Jeju naval base project, it was decided to be suspended at the ending term of Kim Dae-Joong government (1998-2003) in December, 2012. It was only 2006~2007, at the ending term of [ex-Roh Moo-Hyun] government that the project on which the military request and government suspension had been repeated was finally decided. To be sorry, Ahn did not even grasp such basic facts. Therefore he became to conclude that the four ex-governments made “highly politic decision based on the information and resources related to the difficult national security matters,” regarding the Jeju naval base project and to assert that we should accept it. It is far from ‘responsibility’ that he emphasized himself. Further he could have gotten “other information” without limits if he had a little further laid one’s heart such as contacting with Gangjeong villagers. If numerous problems such as matters of procedure, environment, conflict, base layout, [navy’s] failure to carry on National Assembly’s attached conditions, human rights violation, US base, had already made public, Ahn should not have covered various critical minds only with the reason of [so-called] national security that has not been verified, reasoning no access to ‘high class’ information yet. 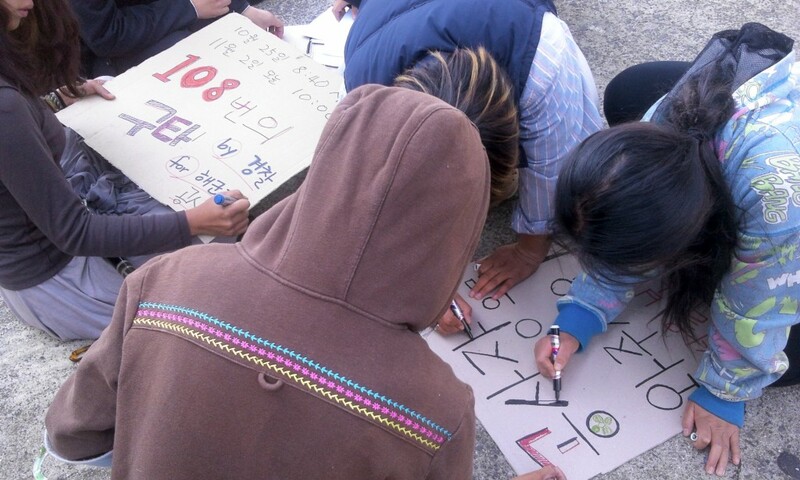 Will there be any national disturbance if the Jeju naval base is not completed before 2015? He should have at least talked on the measure of solution on problems after tentative construction stop. It is because if construction is not stopped NOW, there is a high possibility that we meet irrecoverable situation. If then, consolation to villagers and ‘correct decision,’ that candidate Ahn says could be empty words with no meaning as a result. In that vein, we are DISSAPOINTED that candidate Ahn TURNED DOWN the village’s repeated urgent request on construction stop. 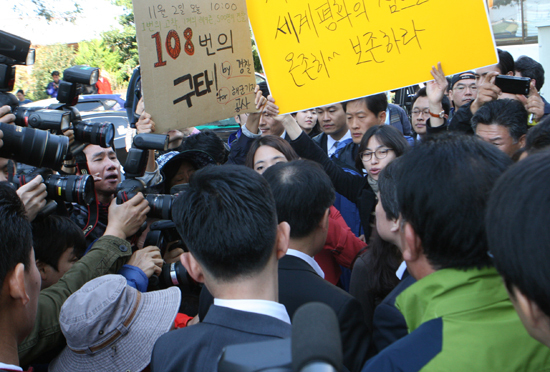 While Ahn is focused, the hard situation of field is under reported by the media. When Ahn visited the village on Nov. 2, many young peacekeepers that could not sleep many days since the start of 24 hour construction on Oct. 25 were heartbreakingly fighting and roughed out by the police. A male peacekeeper was twice choked in his neck by the police on the day. His sleeve was torn. While a young female peacekeeper was crying appealing pain on her shoulder after the police roughed out people, an old policeman laughed looking at her. Personally I saw three female activists were crying in an hour…I say, in an hour. A female activist says her upper cloth was lifted during the police’ roughing out people. Peacekeepers are suffering. They fall back while their shoulder joints are in great pain during the police roughing out of them. Their hearts are being broken with increasing bruises due to repeated police’s human rights violation on them. It is told that navy and their buses were parking in the parking lot from the morning (emergency probably because of Ahn’s visit?) while many policemen were mobilized, too. It is told that a monstrous construction vehicle loaded with many funnels entered into the construction site early in the morning. To people’s fury, many media reports did not even know the location of construction gates. The important thing is the wisdom and will of people. Politicians will not save us. Their steps depend on the power and demand of people. 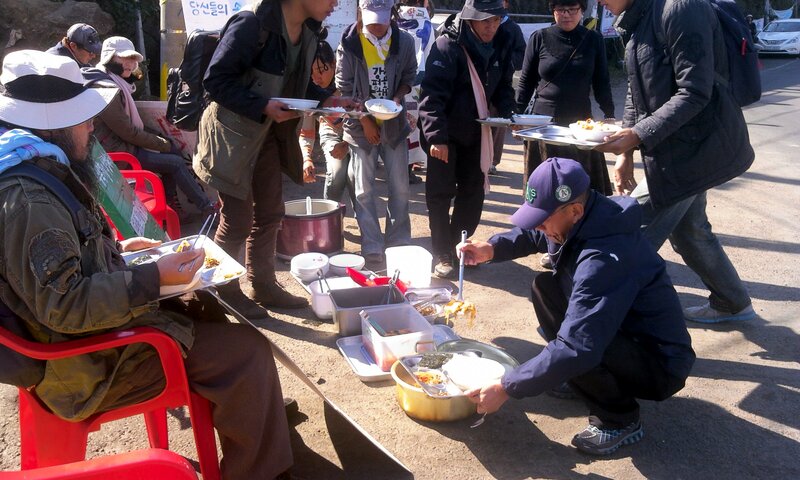 Nov. 2/ As Ahn left construction gate, police arrive to rough out people, People could not even finish their lunch. And invisible though, we have still five prisoners. Immediately stop illegal naval base construction! 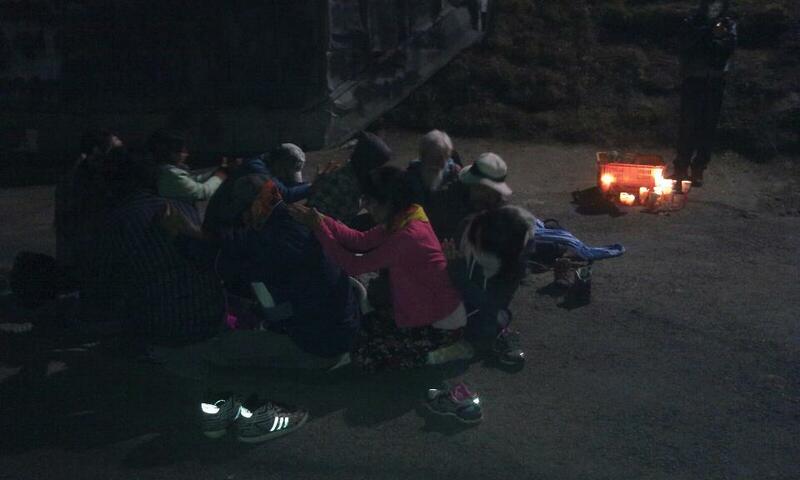 Nov. 2, 2012/ In the candle vigil in front of construction gate at 8pm, people console one another with massages. 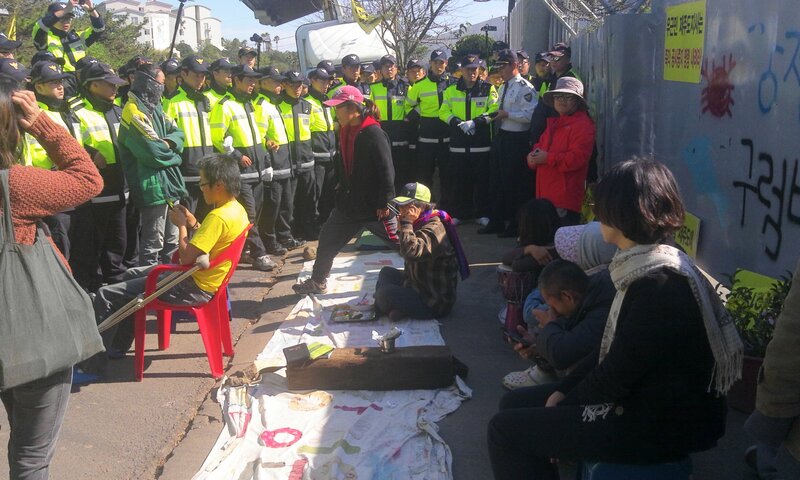 Here is Gangjeong where police do not attack them when a high politician comes. But as soon as the politician leaves, people’s lunch time is even robbed off by the police. 안철수, 제주해군기지 철수야? 안 ‘철수’야?